HeatinGlobal Ltd are THE National Church Heating Specialists. We can assist you in designing, planning and installing a heating system that suits your church heating needs. Heating systems are available in natural gas, electrical, oil and LPG. We are a friendly and professional Gas Safe registered company offering quality church heating and plumbing installation and services throughout the UK, with the highest attention to detail, as well as a strong emphasis on customer service. We supply, fit, maintain and repair church heating systems across the entire country, and have access to church heating grants to help fund our clients projects. 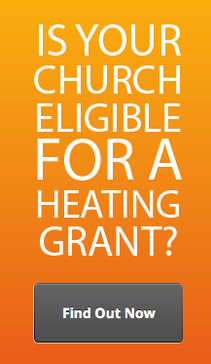 CHURCH HEATING GRANTS AVAILABLE WITH NO INTEREST CHARGED! We are an approved electrical contractor with NICEIC, the governing body for electrical safety. The Welding Institute is the leading international body for welding and joining professionals. We are approved by the Chartered Institute of Plumbing and Heating Engineering. We are members of the Oil Firing Technical Association, who represent the oil heating and cooking industry.